I had never heard of pizookies, had you? 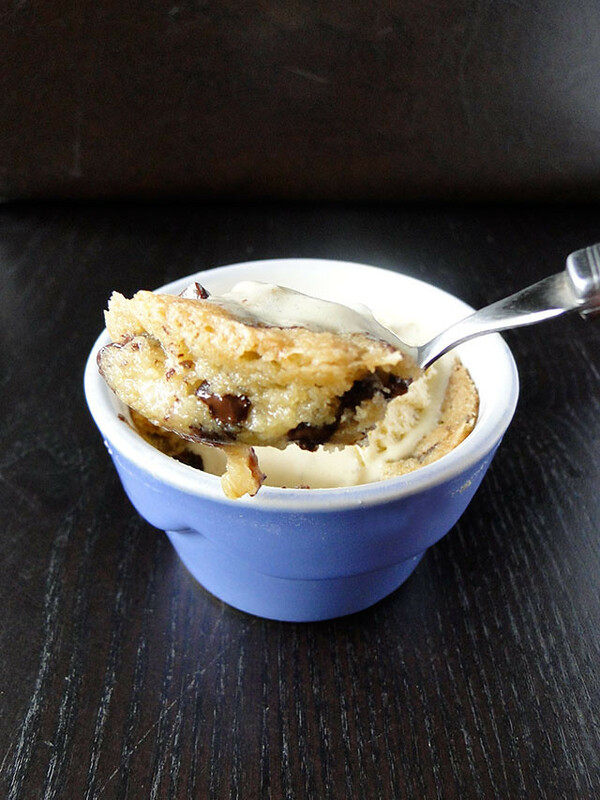 A deep-dish chocolate chip cookies, served in a ramekin and topped with a big dollop of vanilla ice cream. This idea came from a dessert served at B.J's Restaurant & Brewhouse. And what an awesome invention!! Well, I’ve heard about the giant chocolate chip cookie, but this is the first time I’d come across a cookie dough baked directly in a dish. Well, to be honest, it’s a brilliant idea. There’s nothing like a good chocolate chip cookie, unless of course, if it’s more than an inch thick, freshly baked, hot out-of-the oven, rich and delicious topped with scoops of vanilla ice cream and served in its own deep dish. The recipe is so simple and can be made in no time, you simply choose your favorite cookie dough recipe, press it into little individual-sized cobbler pans or gratins, and bake it. I made them in individual ramekins but I think it's also fun to make one big if you've got a shallow kind of crock and share it family style. The cold weather seems the perfect excuse to crave serious comfort food, and on top of this, the holiday season is nearly with us, so wherever you look there are all those lovely comfort foods and delicious treats from our childhood to contend with. There's no denying the comfort when your spoon first breaks the golden crust, then there's the warm chewy cookie contrasting against the cool ice cream melting all over it!! Such comfort that first bite is sure to bring. Mix flour, baking soda and salt together in a bowl and set aside. Beat butter and sugars together with an electric mixer on medium speed until well mixed, about 1 minute. Beat in egg and vanilla. Blend on medium speed for 30 seconds. Don't worry if mixture looks curdled. Scrape down the bowl and beater and beat in flour mixture on low speed, until just a few dry streaks remain. Use a rubber spatula to fold in the chocolate chips. Preheat oven to 350ºF (175ºC). Lightly grease ramekins. You want the cookie to be slightly undercooked for a gooey result, but not doughy. Keep a close eye on things after the first 12 minutes. Remove from oven and eat immediately, with or without ice cream. Mélangez la farine, la levure et le sel dans un saladier. Réservez. Battez le beurre avec les sucres à moyenne vitesse environ 1 mn. Ajoutez l'œuf et l'extrait de vanille, et battez 30 secondes. Ajoutez le mélange de farine et battez à vitesse lente. Versez les pépites de chocolat et mélangez avec une spatule. Préchauffez le four à 175ºC. Beurrez des ramequins. Versez la préparation à ½ dans les ramequins (la pâte va gonfler). Déposez les ramequins sur une plaque à patisserie et enfournez 15 à 20 mn, cela dépend de la taille de vos ramequins. Les cookies doivent être assez tendres. Vérifiez la cuisson 12 mn après, les miens ont mis 20 minutes. Faites sortir du four et mangez immédiatement avec une boule de glace de vanille. Omg! OMG! I never heard of this before, but certainly something I want to try, Its even more sinful than a dozen cookies! That is devilishly scrumptious! I bet that treat is to die for. Okay i've book marked this page - I love it - would be perfect with some vanilla ice cream. I shall ahve to try this using my own favourite cookie recipe! 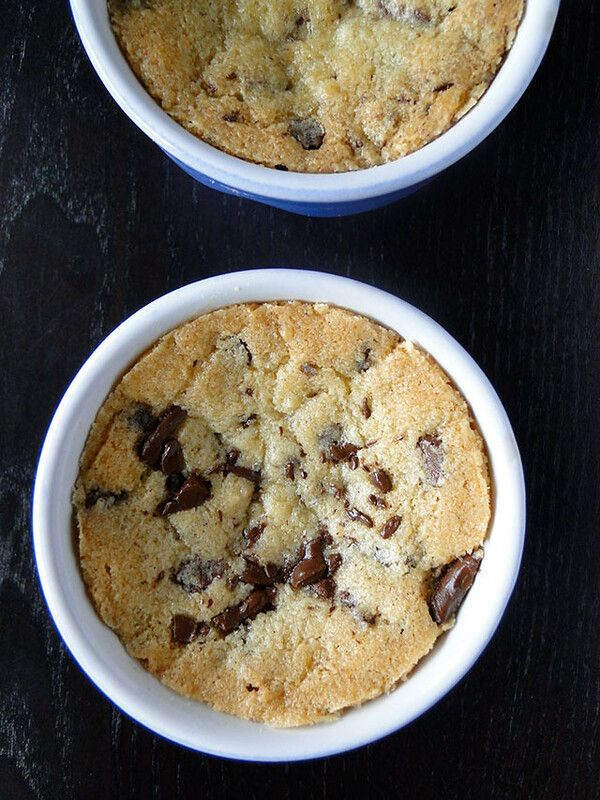 Cookies in a deep dish...that's a super idea! Clever idea and a nice take on a classic. Bravo, Cherine! I always love turning cookie dough into something other than the traditional cookie form such as this. It just makes for a different and just as pleasing presentation! oh what a great idea! looks so yummy! Love the first photo with the spoon dipping into the blue ramekin. Yummy! Oh my gosh, now this is a MUST-MAKE recipe!! Gosh..Killing..this stuff looks and sounds new ! As such I can never be satisfied with one cookie! jamais vu de cookies ds des petits ramequins, trop mignon et ultra gourmand ! Tu as raisin l'idée est géniale! It can't get more delicious than this. My oldest daughter will love this. Yum, what a perfect treat! Wow! Superb! I must make this for Christmas and surprise my family. thanks! What a novel idea! I want a big glass o' milk with this. Wow!! There are NO words for this amazing cookie! Yummy!! :) I need to make this soon!! This is an awesome idea! I would love to try and your pictures are making them even more tempting! What a cool idea! They look SO good! I am bookmarking this one for a dinner party dessert idea - thanks! A deep dish cookie? Brilliance! I love it. In fact, I'd really love one right now. Wonderful recipe! Nope, never heard of these before either. But can I just say... O-M-G! I've got to have some of that! LOl really, these sound like a fabulous treat. Cherine, that is a truly BRILLIANT idea! I can't believe I'm such a cookie monster and never thought of this!!! What an interesting recipe Cherine ! Lovely pics! 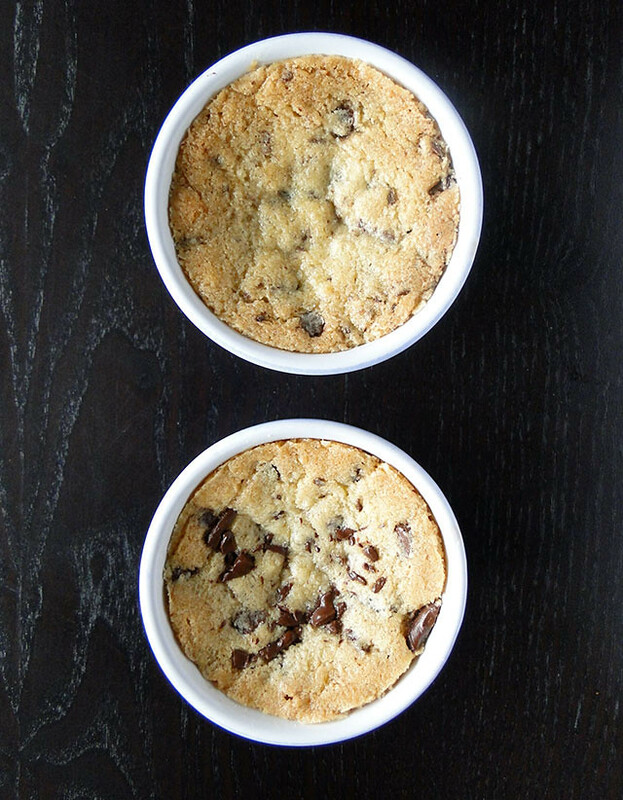 These ramekins look really yummy! Love chocolate chips! Mmm looks great... I think of holding this warm small dish, sitting on the couch, covered with a blanket,storming outside, and enjoying the warmth and ooziness of chocolate. Novell idea and 'oh so decadent'. I would love to have a chocolate chip cookie as dessert! That you for sharing the yumminess! What a fantastic idea!!! It looks so good. manger des cookies à la cuillère : une très bonne idée ! What an awesome idea!These look amazing, I'm filing this recipe away for our next dinner party. Thanks for the idea! I really love this idea! It takes a humble chocolate chip cookie and turns it into something extra special. Oh man. Are you kidding me? This is fabulous. I high-five you and send you kisses. I love this little twist. A deep dish cookie sounds so good! Made this last night, it was excellent!